A reticle eyepiece is virtually indispensable for serious astronomy observing and astrophotography. The Agena 20mm reticle eyepiece boasts a double line crosshair laser etched into optical glass that extends from edge to edge. It greatly simplifies centering celestial objects in the eyepiece for more accurate go-to alignments. Unlike single line crosshairs in other illuminated reticle eyepieces, the double line design doesn’t obscure small targets when attempting to center them – they remain visible in the small box created by the intersection of the two pairs of double lines. Alignment can also be achieved by putting the object at the intersection of any two perpendicular lines. The reticle can be rotated and facilitates polar drift alignment routines for equatorial mounts and precision guiding for astrophotography. Eyeglass wearers will appreciate the focusing mechanism that allows them to bring the reticle to a sharp focus. 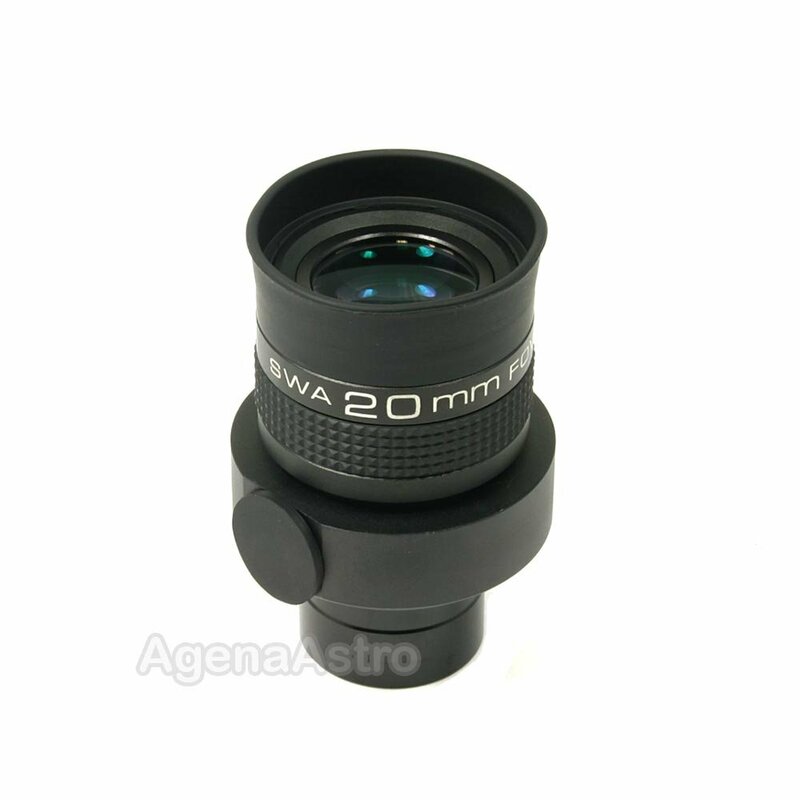 The 20mm focal length provides a wide 70° apparent view of the sky allowing you to find objects and alignment stars more easily than shorter focal length eyepieces. Note that this eyepiece does not include an illuminator to light up the reticle pattern with red light. The eyepiece features a standard 8mm metric illuminator thread which accepts many (but not all) commonly sold illuminators if you wish to convert it into an illuminated reticle eyepiece yourself. Agena courteously answered my (probably inane) questions, and helped me with eyepiece decisions without making me feel dumber than a bag of hammers. Seems they get that not everyone out there has 37 years of experience with astrophotography! A bit pricey but a good value. Great service. Very good quality. Works great. Obtained this eyepiece to aid in in EQ mount multi star alignment procedure. Have often struggled with low eye relief reticle eyepieces. This solves that problem making viewing much easier. This item is lower power so it may not be best for guiding applications. Reticle spacing is wider but you can choose any corner of the box for high accuracy alignment.